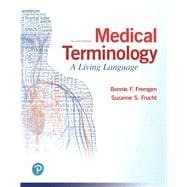 by Fremgen, Bonnie F.; Frucht, Suzanne S.
For courses in medical terminology. MyLab™ is the teaching and learning platform that empowers you to reach every student. By combining trusted author content with digital tools and a flexible platform, MyLab personalizes the learning experience and improves results for each student. With MyLab Medical Technology, students build a solid foundation of medical language through interactive games, Dynamic Study Modules, and narrated lectures. Note: You are purchasing a standalone product; MyLab Medical Terminology does not come packaged with this content. Students, if interested in purchasing this title with MyLab Medical Terminology, ask your instructor for the correct package ISBN and Course ID. Instructors, contact your Pearson representative for more information. Bonnie F. Fremgen is a former Associate Dean of the Allied Health Program at Robert Morris College. She has taught medical law and ethics courses as well as clinical and administrative topics. In addition, Dr. Fremgen has served as an advisor for students’ career planning. She has broad interests and experiences in the healthcare field, including hospitals, nursing homes, and physicians’ offices. Dr. Fremgen holds a nursing degree as well as a master’s in healthcare administration. She received her PhD from the College of Education at the University of Illinois. Dr. Fremgen has performed postdoctoral studies in Medical Law at Loyola University Law School in Chicago. She has authored five textbooks with Pearson. Suzanne S. Frucht is an Associate Professor Emeritus of Anatomy and Physiology at Northwest Missouri State University (NWMSU). She holds baccalaureate degrees in biological sciences and physical therapy from Indiana University, an MS in biological sciences at NWMSU, and a PhD in molecular biology and biochemistry from the University of Missouri–Kansas City. For 14 years Dr. Frucht worked full time as a physical therapist in various healthcare settings, including acute care hospitals, extended care facilities, and home health. Based on her educational and clinical experience she was invited to teach medical terminology part time in 1988 and became a full-time faculty member three years later as she discovered her love for the challenge of teaching. Dr. Frucht has taught a variety of courses, including medical terminology, human anatomy, human physiology, and animal anatomy and physiology. She received the Governor’s Award for Excellence in Teaching in 2003. After retiring from teaching in 2008, she continues to be active in student learning through teaching medical terminology as an online course and writing medical terminology texts and anatomy and physiology laboratory manuals.